This was a year when the charm of wasted slackers wore very thin. Russell Brand was wholly obnoxious in the Arthur remake, Seth Rogen a useless bore in The Green Hornet. 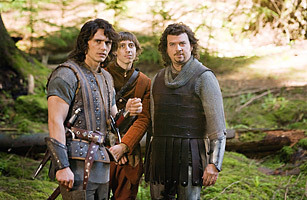 But the most repellent of them all was Danny McBride as Thadeous in Your Highness. The movie seemed to have Mel Brooksian potential: two medieval princes, one saintly (James Franco), the other a lazy stoner (McBride) set out on a quest to save a damsel in distress (Zooey Deschanel). With David Gordon Green directing, this was basically a Pineapple Express reunion. But Your Highness turned out to be a bewildering disaster that even a dozen bong hits couldn't save. McBride, who co-wrote the screenplay, is a funny guy, but the film's jokes skew toward appealing to homophobes and fifth graders. It truly feels as though something is missing, almost as if McBride and Green sketched out a series of situations that they planned to fill in with improvisation before being unexpectedly called away. How did Natalie Portman justify the gift of her bare bottom to a movie like this?